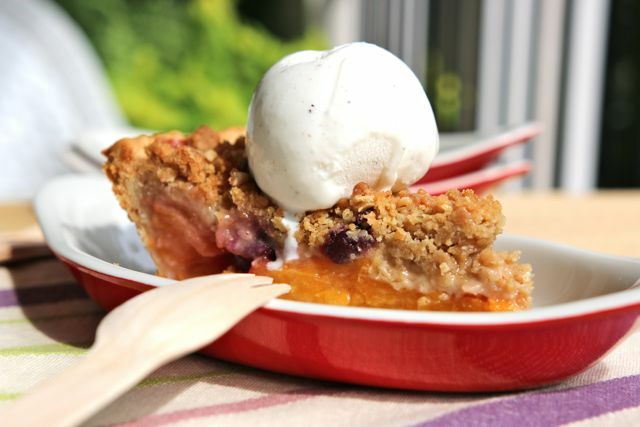 This is not the first peach crumb pie recipe you have seen at The Pie Academy. And – as someone who shares the above sentiment with our esteemed author – it will not, likely, be the last. But it may well be the best, on several counts. For the first time here, peaches share the spotlight with my other favorite summer fruit: blueberries. This combination is a no-brainer, and hardly puts me in the genius realm. Still, considerable effort – with predictable repercussions to my midsection – has been made to calculate the ideal proportions of one to the other, and this 5 to 1 ratio is just right. It’s still a peach pie. The blueberries are guests at this party. But they’re not loud or boisterous or trying to steal the show. As it should be: peach pie should never suffer from an identity crisis. 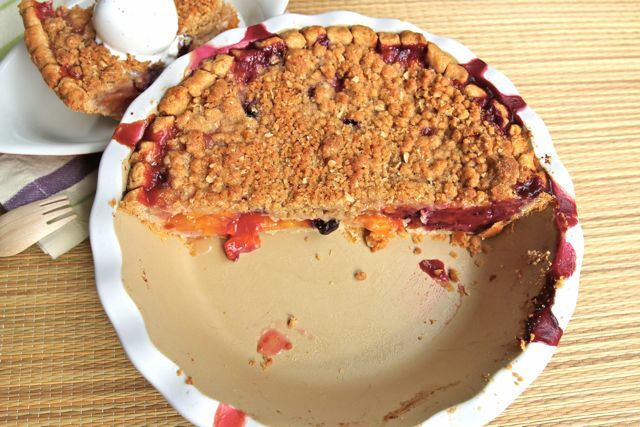 Another improvement over past peach pies: the quality of the crumb topping and fruit interface, the technical name I made up for the place where the fruit ends and the topping begins. 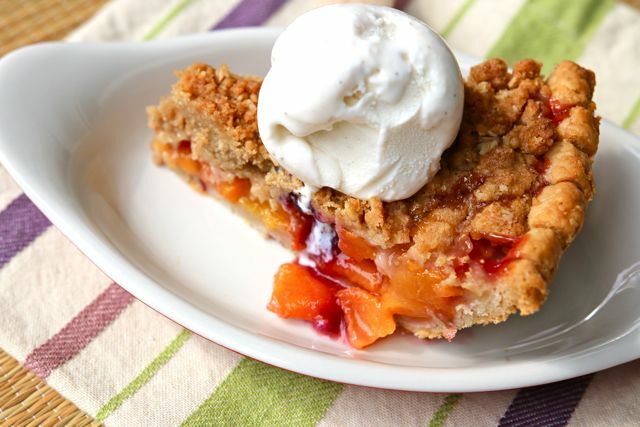 If the pie is too juicy – and peaches are famous for their juiciness – the crumb topping will act like a sponge and absorb too much liquid from below. The result: a soggy interface. The solution? Like we did a few weeks back with our plum tart, we’ll first toss our fruit with sugar, then set it aside to let it juice. We’ll then boil the juice, reduce it by a little more than half, and add it back to the fruit. Your pie still ends up juicy, but not awash in it. The concentrated peach flavor permeates the filling. AND your topping maintains its individual character. Less juice in your pie also means less slump in your slice, so there’s also a cosmetic advantage to this boil-first approach. This holds true whether you’re using a crumb crust, or tucking the filling into a double crust. Now, before you begin, a couple of last minute reminders. The quality of your peach pie is directly proportional to the quality of your peaches. If they’re not sweet, juicy, and ripe when you begin, don’t expect your pie to rise, miraculously, above its own limitations. 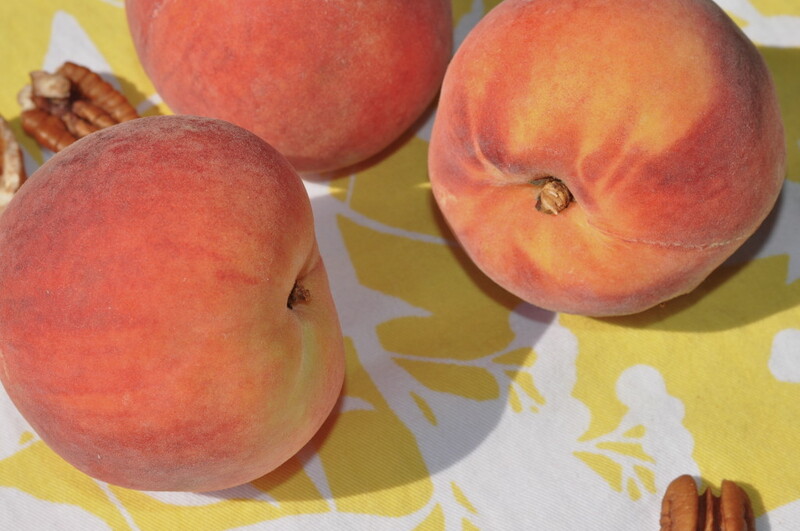 If you can’t find great peaches in your area, you should probably move here to South Carolina. Don’t peel peaches with a peeler or paring knife. A peach is not an apple, and you’ll end up removing way too much of the lovely peach flesh. Blanch them instead: bring a large saucepan of water to a boil, lower in your peaches with a slotted spoon, and submerge for 30 seconds. Remove them, wait a minute or two, and the skins will peel right off. 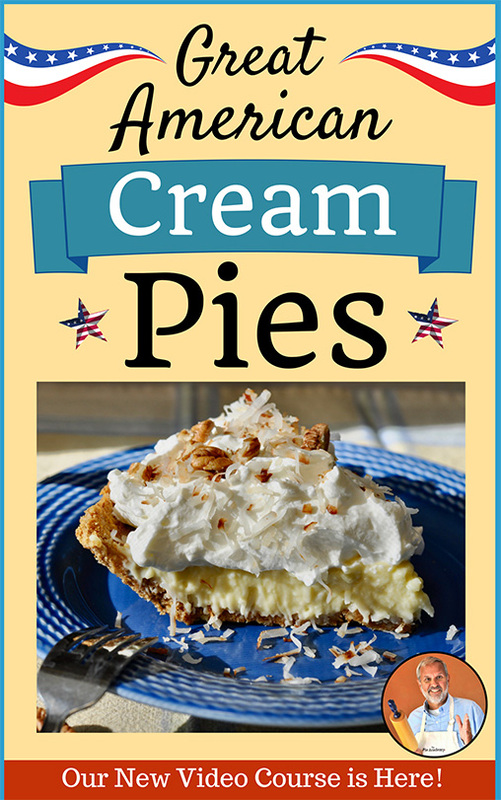 As always, I wish you the best with this pie recipe. Keep sending me your photos and comments. Incidentally, quite a few of you sent me glowing feedback and your photos of the most recent Savory Corn Pudding Pie, making it one of the most popular pies to date. 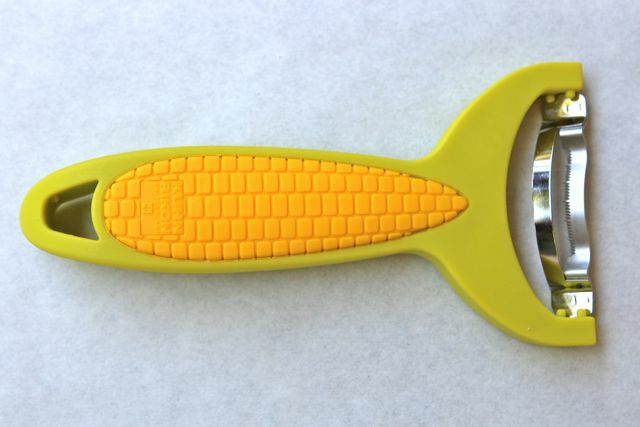 Speaking of corn pie, you’ll recall how, in my last post, I showed you a neat little tool I’ve been using this year to cut corn off the cob – the Corn Zipper. I told you that we had three of them to give away – courtesy of the manufacturer, Kuhn Rikon. All you had to do was visit our new online store, browse around, and send us your feedback on the sorts of items you’d like to see in the store in the future. Congratulations to all of you! We’ll be in touch with each of the Corn Zipper winners. 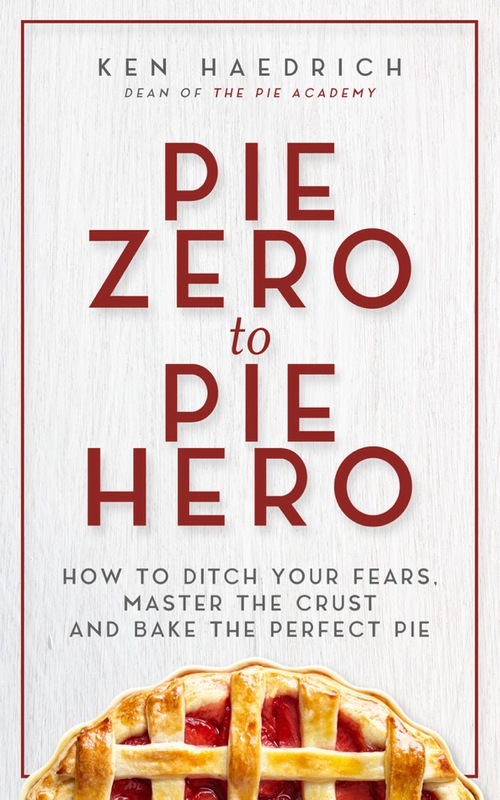 Several of you have written in the past and suggested that we create a table of contents so you have a quick-and-easy way to search and find the recipes and videos in The Pie Academy archives. You’ll see the new Table of Contents tab at the top of each page on the site. Click, and it will take you into the complete archives. We appreciate your patience while we worked on this project, and our gratitude to those of you who emailed with this user-friendly suggestion. 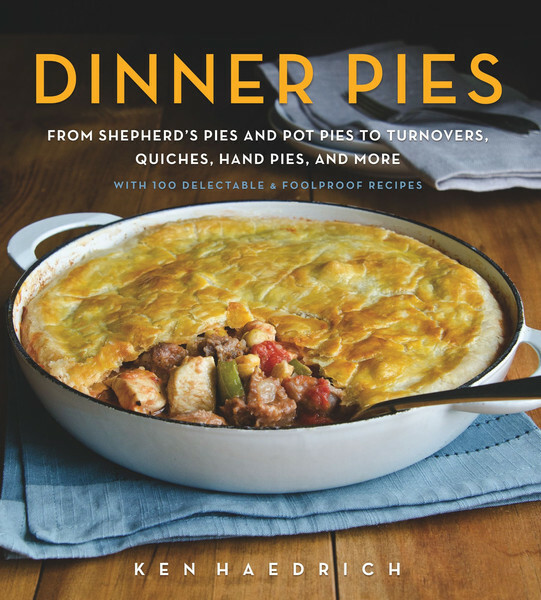 RECIPE NOTES: Use any single-crust pie dough recipe here that makes enough for a 9 1/2-inch deep-dish pie, including the GOOD BASIC PIE DOUGH, and FOOD PROCESSOR PIE DOUGH. 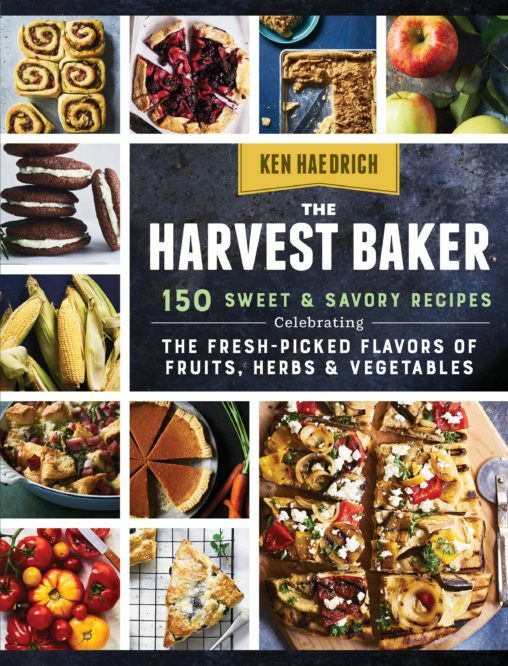 See the Table of Contents for other pie dough recipes. If you haven't already, prepare the pastry and refrigerate for at least 1 1/2- to 2 hours before rolling. When the dough has chilled, tear off a 16-inch long sheet of wax paper and dust it lightly with flour. Place the dough in the center and roll it into a 13- to 13 1/2 inch circle. Invert the paper and pastry over a 9- or 9 1/2-inch deep-dish pie pan and peel off the paper. Gently tuck the pastry into the pan, without stretching it. Turn the edge back and pinch it into an upstanding ridge. Flute, if desired. Refrigerate the pie shell. Combine the sliced peaches and sugar in a large mixing bowl; mix well. Set aside for 1 hour, to juice. While you're waiting, skip ahead and make the topping. Cut the butter into dice, as instructed, and place on a flour-dusted plate. Refrigerate. Combine the flour, oats, brown sugar, salt, and cinnamon in a food processor. Pulse several times, to mix. Scatter the cold butter over the dry ingredients. Pulse the machine, repeatedly, until the mixture resembles fine crumbs. Empty the crumbs into a large bowl and rub them between your fingers until they're clumpy and buttery, but even-textured. Refrigerate. When the peaches have juiced for an hour, preheat the oven to 400°. Adjust the oven rack so it is one position above the lowest position. Put a colander into a larger bowl; pour in the peaches and their juice. (You should have about 1/2- to 3/4 cup juice.) Drain for several minutes, then transfer to peaches to another bowl. Add the blueberries and cornstarch. Mix well, until all of the cornstarch is incorporated. Stir in the lemon juice, lemon zest, and vanilla. Set aside. Heat the 3 tablespoons butter in a medium size skillet. As it starts to melt, add the reserved peach juice. Bring to a boil, and continue to boil for 4 to 7 minutes, until the mixture has darkened several shades and is syrupy and reduced by a little more than half. Remove from the heat. Transfer the filing to the chilled pie shell. Scrape the reduced peach juice over the fruit, working it in a little with a spoon so it doesn't just sit on top. Put a little less than half of the crumb topping on top of the fruit and spread it around evenly. Put the pie in the oven and immediately lower the heat to 375°. Bake for 30 minutes. Slide the pie out and carefully spread the rest of the topping over the first layer. Bake about another 30 minutes. When done, the topping will be golden brown and the juices, coming up through the topping and around the edge, will bubble thickly. Transfer to a rack and cool for at least 2 hours before serving. Makes 8 serving.